At this year’s anti-police brutality march, just moments before Montreal police clashed with demonstrators. Photo Jackson Long. One protester threw paint on a police officer, on Ontario St. Photo Daren Zomerman. While a police helicopter flew overhead, protesters carried black flags and chanted slogans about their hatred for the Montreal police. People gathered for food at Lafontaine Park before the offset of the 22nd annual march against police brutality, Thursday evening. By 8 p.m., protesters marched down Rachel St. until they headed south Papineau Av. They soon hit Ste. Catherine St., despite police orders that protesters stay away from the area between the corners of Metcalfe and Bleury Sts. Fireworks and paint bombs were set off after some protesters smashed the windows of a Second Cup and the Laurentian Bank at the corner of Ste. Catherine and Wolfe Sts. Then, the police tried to kettle the crowd but were unsuccessful. 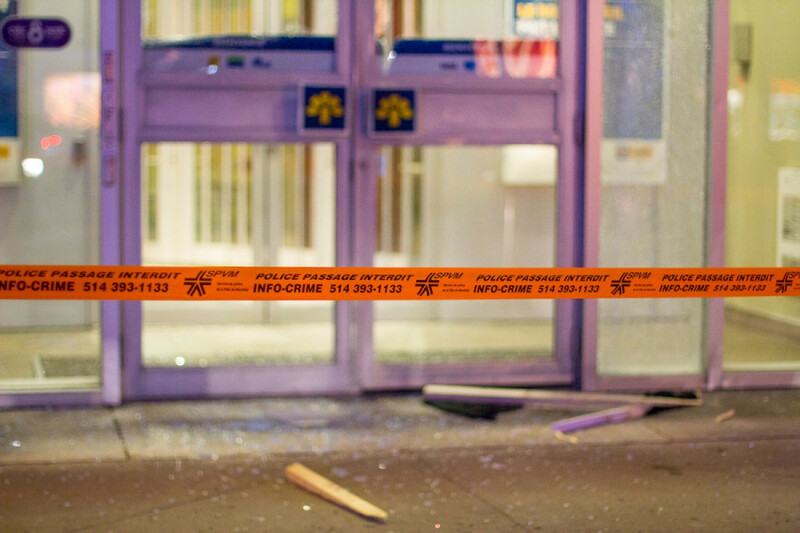 Protesters smashed the windows of a Laurentian Bank along Ste. Catherine St. Photo by Jackson Long. Police dispersed the crowd by chasing protesters. Once the group was successfully dispersed, some individuals were targeted. One photographer was pushed to the ground at the corner of De Maisonneuve Blvd. and Amherst St.
By 9 p.m., many protesters had left but police were still patrolling the streets. By the end, three arrests were made, three tickets given, and three police officers were injured alongside one protester, who police claim was hit by a projectile from another protester. 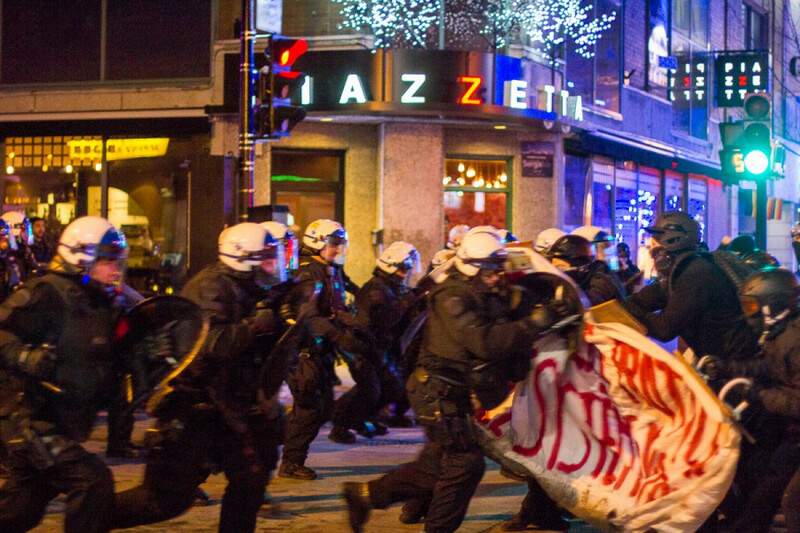 Protesters, posting through a Facebook page associated with Red and Anarchist Skinheads Montreal, have since claimed the protester injured was actually hit by police officers. “The women who got badly injured to the head and who left in an ambulance had been hit to the head with a baton by a cop, as they charged the crowd at the intersection of Ste. Catherine St. and Amherst St.,” they wrote to The Link this afternoon. The anti-police brutality march takes place every year on March 15, and aims to address other issues linked to police brutality. 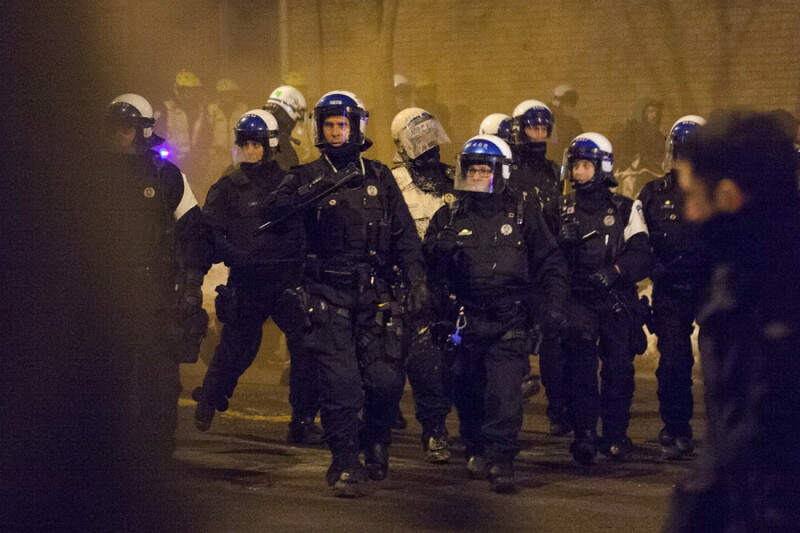 This year, the march addressed police complicity with the far-right in Quebec. “What’s interesting about this, is that the police as an institution replicate and amplify exactly what these fascist groups are talking about,” said one member of the Collective Opposed to Police Brutality, under the pseudonym Joe Hill. “Jailing people of colour, terrorizing and brutalizing members of the Black community, of the Muslim community, of the LGBTQ community, in a lot of situations they work in tandem to oppress communities,” he added. For the first time since 2012, the protest organizers now had no reason to give the police a march itinerary, since the Quebec Courts of Appeals recently struck down the requirement in municipal bylaw P-6 to provide a route to the police before the march. Sandra Cordero of the Movement Action Justice, an organization that helps people brutalized by police, also joined the march. 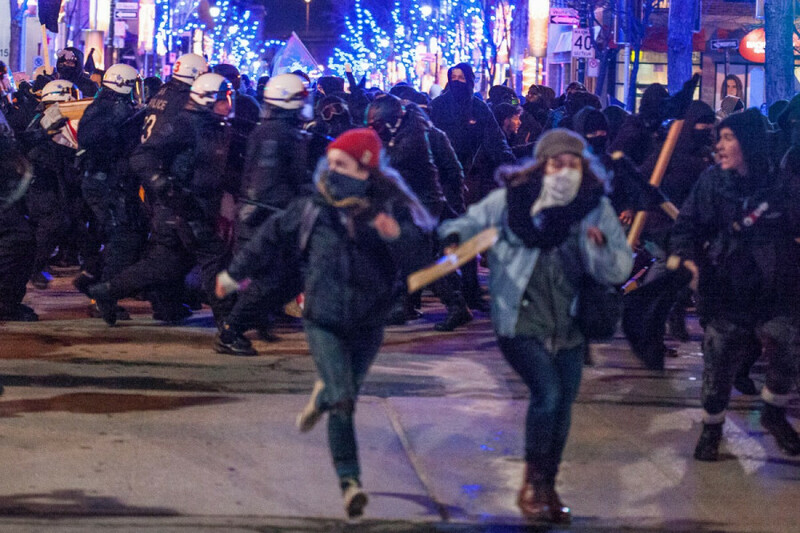 Montreal police chased protesters along Ste. Catherine St. Photo by Daren Zomerman. Cordero herself was a victim of police brutality on May 1, 2015. During the May Day protest that year, she and other women of colour had tear gas thrown at them. That day, she and other protesters began a sit-in at a McDonald’s. She said that police officers came up behind them and wanted them to vacate the area and move but she didn’t know where they wanted her to go. An officer in full riot gear hit her back, and then pushed her to the ground and twisted her arm back, arresting her just after. She lost her glasses when she fell, but the police didn’t care, she said. Gabriel Duchesneau, also at the protest, said he was brutalized by police at another May Day protest in 2012. He was hit in the back of the head by a police baton and fell to the ground. Police told him to move, but he couldn’t. Another officer hit him with a shield and Duchesneau lost consciousness. He had head wounds, three fractured bones, and cerebral hemorrhage. He also said no ambulance was called. Duchesneau now said he participates in these marches to raise funds for his court case against the city. “It’s very important to show that we’re here, that this is intolerable and that we’re here in solidarity with those communities that face that brutality and that fear by the colonial, capitalist, and patriarchal institutions such as the police but also these colonial fascist organizations that are hell-bent on terrorizing,” said Hill.